In the cartoon industry, Space Ghost is almost single-handedly responsible for the popularity of superhero cartoons in the 60's. The series was drawn so well and the stories were so imaginative that kids were glued to CBS every Saturday morning. This success forced the other networks to develop superhero shows like Superman in order to battle the mighty Space Ghost. This page has been viewed 4 times this month, and 21,854 times total. 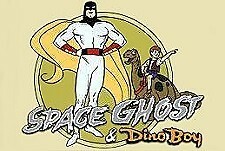 Space Ghost and Dino Boy Episode Guide -Hanna-Barbera by Big Cartoon DataBase is licensed under a Creative Commons Attribution-NonCommercial-ShareAlike 4.0 International License.